In my column on Friday, I explained that behind the pork barrel furor engulfing the nation are three cover-ups managed by the Aquino administration. The first is the fact that with the utter demonization of “pork barrel queen” Janet Lim Napoles, the Aquino government has covered up the bigger operations of a mysterious person or gang that in fact siphoned off P4 billion of taxpayers’ money into legislators’ pockets. That is practically double the P2.2 billion Napoles allegedly handled. The second cover-up involves the fact that out of 325 House of Representatives members and 17 senators, the Justice Department, the Ombudsman’s investigators, and their stable of whistle-blowers have singled out only three senators—Juan Ponce Enrile, Jinggoy Estrada, and Ramon Revilla—leaders of the opposition, with the latter two in fact having declared that they would be running either for president or vice president in 2016. Isn’t that way too convenient, that the barrage of charges against the two, their arrest and incarceration have painted them as crooks, two years before elections in 2016? Isn’t that too convenient, with the ratings of Mar Roxas—Aquino’s bet for 2016—slipping from about 17 percent at the start of the year to single-digit levels in recent polls, with his rival Jejomar Binay, allies of Enrile and Estrada, moving from 53 to 57 percent? The third cover-up is the Commission on Audit’s (COA) failure, refusal, or foot-dragging in undertaking an audit of the use of funds from the Priority Development Assistance Fund (PDAF) from 2010 to 2013, or during Aquino’s watch, as well as of his patently unconstitutional new form of pork, the Disbursement Acceleration Program (DAP) funds. The PDAF releases from 2010-2013 (already the Aquino administration) totaled P62.5 billion, double the P26.1 billion from 2007 to 2009, which is the subject of the current pork-barrel cases at the Sandiganbayan. But these are dwarfed by the DAP, which totaled P157 billion from 2011 to 2013 according to official data from the Budget department itself (www.gov.ph/2013/10/07/qa-on-the-disbursement-acceleration-program). That is, Aquino’s pork barrel since he assumed office amounted to P220 billion ?#8211;P62.5 billion PDAF released in his first three years, plus the P157 billion DAP. Yet so far, the COA has turned a blind eye to these suspicious siphoning off of public funds committed during the term of Aquino. • Has she issued the office directive ordering the COA’s special audits unit to undertake an audit of the PDAF from 2010-2013, and of the DAP from 2011-2013, in the rigorous manner the agency audited the funds released from 2007 to 2009? It is not just me who’s asking for an audit of the PDAF funds from 2010-2012. It was the second highest official of land, Vice President Jejomar Binay, who as early as last year, and as reported in newspapers on August 31, 2013, demanded that the auditing should not only include the years 2007 to 2009, but also the years until 2012. 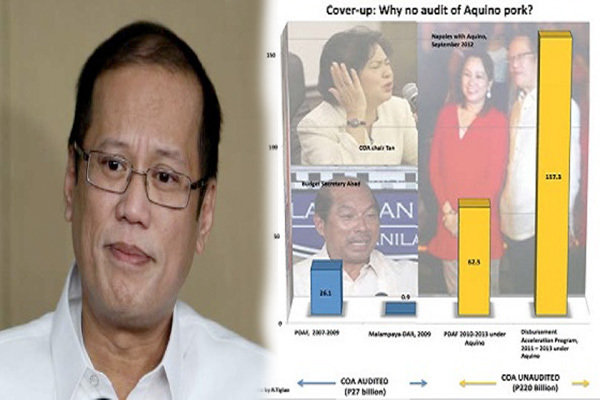 • Given the fact that such an audit of Aquino’s PDAF and DAP would clear the COA and this administration of the accusations that they are not really on an anti-corruption drive but on a campaign to bury the political opposition, has Tan deployed more auditors so the audits can be accelerated, considering the amounts involved are eight times bigger than those for 2007-2009? • Can she promise the nation that the audit of Aquino’s pork barrel will be finished this year, and not after the 2016 elections? Would Tan stonewall the audit of Aquino’s pork barrel as a quid pro quo for her to be appointed soon as a Supreme Court justice? We hope not. COA must immediately audit Aquino’s pork because it involves a much larger amount of P220 billion, which is eight times the P26 billion pork for 2007-2009. More importantly, Aquino had blatantly used the PDAF and the DAP especially in 2011 and 2012 to bribe first members of the House in filing an impeachment complaint against Chief Justice Renato Corona, and then the senators to convict him. Another P4 billion was disbursed to congressmen in 2012, at P15 million each, for having filed the impeachment case against Corona. Think about it. With Aquino bribing congressmen and senators by throwing at them millions of pesos worth of pork barrel funds, would he or his officials have tightened up procedures to make sure that the legislators don’t steal the proceeds, as they had done in 2007-2009? Or, as rumors have circulated, was it Napoles herself and another still unidentified mastermind of the pork barrel scam who helped the legislators, with Aquino’s endorsement, to steal from the pork barrel bribe the president gave them so they’d remove Corona? Was Napoles’ participation in the pork barrel bribes in 2011-2012 the reason for her inexplicable confidence that she would survive her current nightmare, for Aquino to personally see her in Malacañang when she surrendered in August and accompany her to the police headquarters? Or was it an Abad-Napoles tandem in this bigger pork-barrel scam under Aquino? Note that Abad was a congressman for nine years, from 1995 to 2004, who religiously collected his pork barrel that was used for his 16,000 constituents in his tiny province of Batanes. Sponsor Especially since the COA had asked him for documents for its 2007-2009 audit, it is impossible that Abad did not know how people’s money was being stolen through the pork barrel system. Did he advise Aquino that this is the easiest way to bribe Congress so it would remove Corona, and recommended Napoles to help out? Was it this that Napoles was really referring to when she wrote in her sworn statement that it was Abad who taught her how to use NGOs for the pork barrel scam? For all of Aquino’s sickening blah-blahs about “walang mahirap kung walang corrupt,” did he ever talk against the pork barrel system before it was exposed in 2013? Since he, and he alone, directed the use of the DAP, Aquino used these funds as his own personal treasury. Undeniably, Aquino’s hands are tainted with pork barrel money. Note also COA’s wrong priorities to support Aquino’s fake anti-graft campaign. In another move to persecute former President Arroyo as well as to pin down Napoles and the three senators, the COA undertook a special audit of P900 million of the Malampaya funds coursed in 1999 through the agrarian reform department starting in 2011. But what may be compared to the Agrarian reform department’s Malampaya scam is the P8.6 billion—ten times the Malampaya money—Aquino gave to the ARMM from the DAP funds, purportedly to accelerate the region’s development. And how were these distributed? Through Aquino’s hand-picked ARRM Governor Mujiv Hataman who even had a media-covered ceremony distributing P10 million in checks to officials of the region in January 2013. Aquino even complained at that event that Hataman wasn’t disbursing the funds quick enough! For all its posturing as an anti-corruption body, the COA under Tan will be judged by history as another institution prostituted by Aquino, unless she orders the audit of this president’s P220 billion pork barrel, the biggest amount of government money ever put under a president’s sole whim in our history, and the biggest secret of all in this saga.